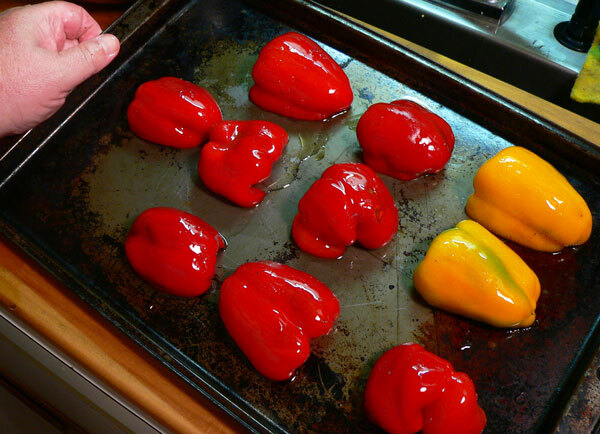 Follow step-by-step, photo illustrated instructions and learn how to roast peppers in your oven. 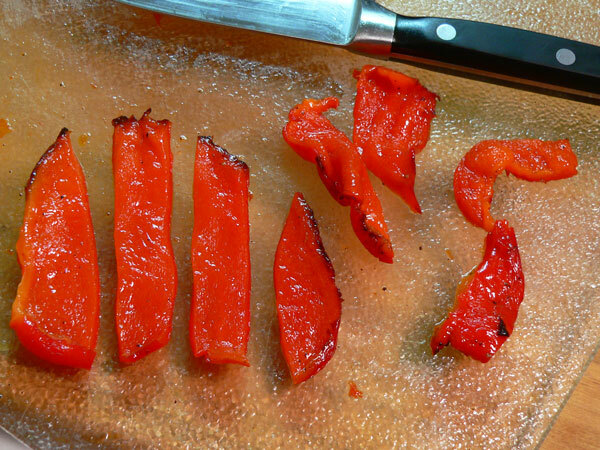 Roasting peppers is a great way to preserve some of the summers bounty of peppers, and you’ll find lots of uses for them in the weeks ahead. We’re roasting these to use as a pizza topping and we’ll show you just how easy it is to do. Printable recipe included. 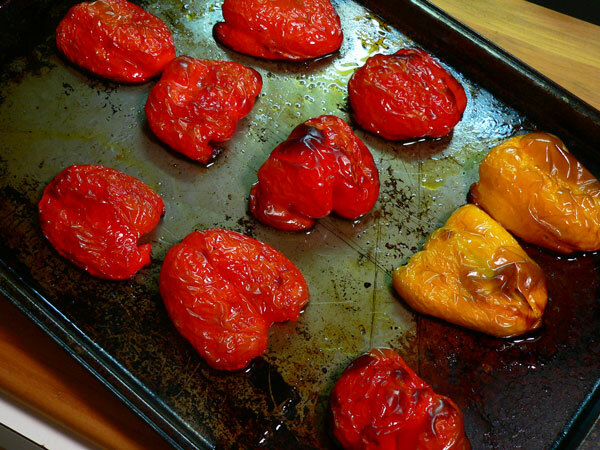 How To Roast Peppers: Another tip and technique from Taste of Southern. A friend gave me a couple of really pretty Bell Peppers a few days ago. Most of them were red but I did get a yellow one in the bunch and I just love how bright the colors are. Bell Peppers seem to be getting more and more expensive lately. I’ve mentioned it before but when I can get them during the summer, when they are cheaper, I chop up a good number of them and place them in the freezer. That way, I can just pull out what I need for a recipe and keep on cooking. Yes, fresh is great, but when they get up to about $1.50 each during the winter, I don’t mind using the frozen ones in the freezer. Sometimes, I find those little plastic boxes of them already cut up in the super market. They have some diced, and some sliced for stir fry along with some diced onions near the fresh produce where I shop. I always check them out and often find some reduced in price. I can’t seem to resist them when they are reduced. Is it just me? I’ll bring them home and spread them out on a baking sheet, pop it in the freezer for about 30 minutes, then place them in a plastic bag and keep them frozen. If I could only be that frugal on some other things, I might would do OK. 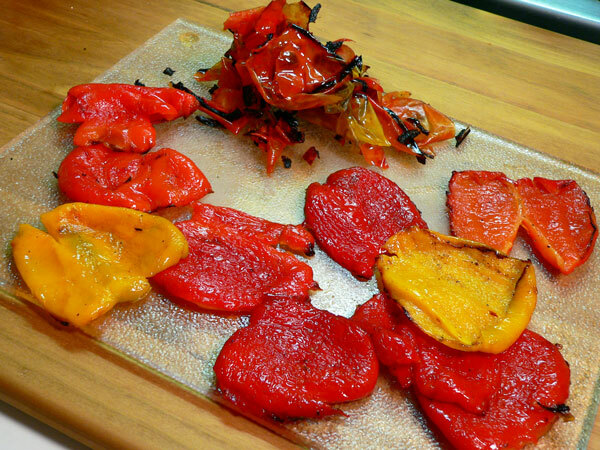 So, I decided I’d do a little quick post on how to Roast Peppers in the oven. Once you’re done, you can store them in some Olive Oil and use them for salads, pizza toppings, in pasta, in spaghetti, in omelets, soup, well… you get the idea. So, next time you find some reasonably priced Bell Peppers, pick up a few extra and try roasting them in your oven. I’m going to use these for topping on a pizza very soon. I think you’ll like them if you give it a try. Ready to roast some peppers? Alright then… Let’s Get Cooking! 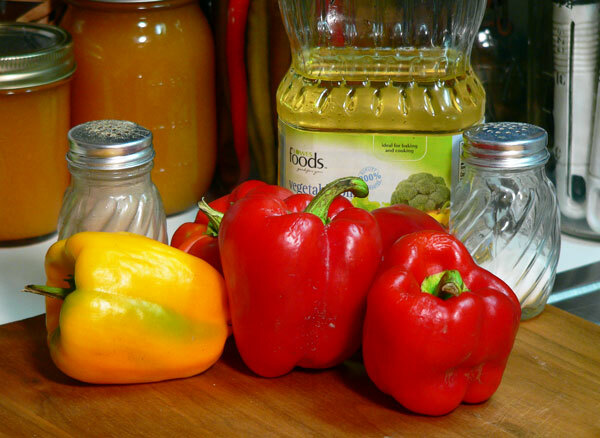 Roasted Peppers: You’ll need these ingredients. 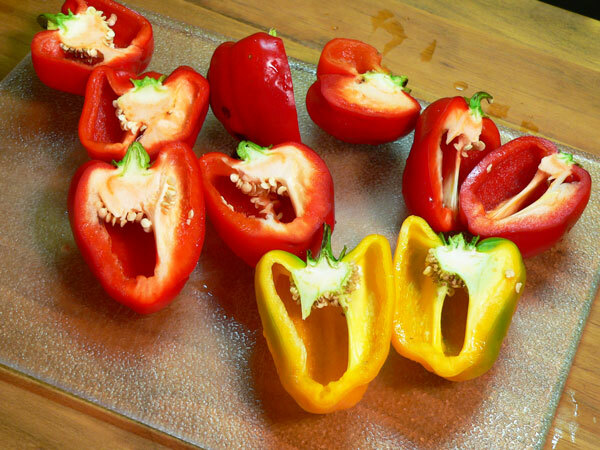 You’ll need to give the peppers a quick rinse under cold running water. Dry the peppers and then cut each one in half. Remove the stems and seeds from each half. 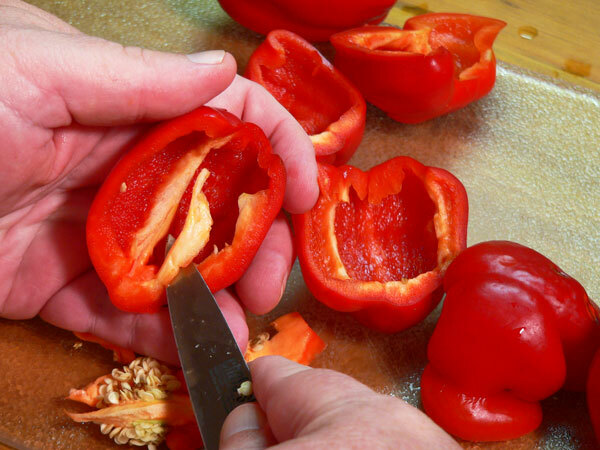 Next, remove the “pith,” or that white looking membrane from inside the peppers. Just cut it out with a paring knife. 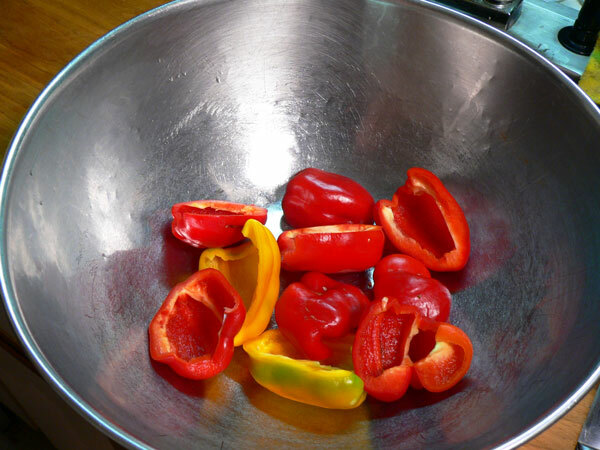 Place the cleaned peppers in a mixing bowl. Pour a couple of Tablespoons of Vegetable Oil over the peppers. 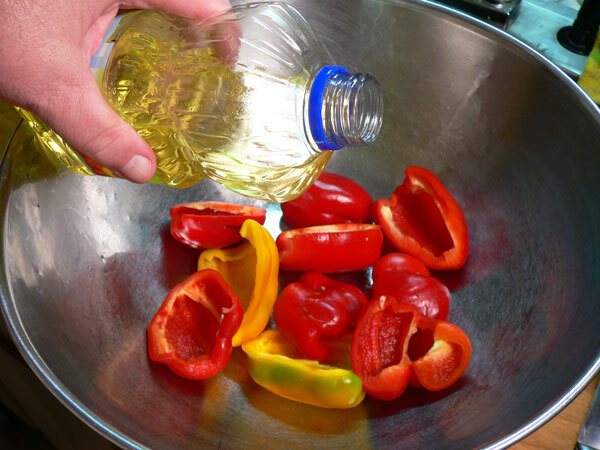 Use your fingers and rub the Vegetable Oil over the outside and the inside of each pepper. Sprinkle on a little bit of Salt. Not much, just a light coat over all the peppers. Do the same with the Black Pepper. Spread the peppers out on a baking sheet, skin side up. Place the pan in the oven and let them roast about 10-15 minutes or until they are tender and lightly charred on top. Don’t let them burn, just get a little charred coating on the skin of each one… like this. 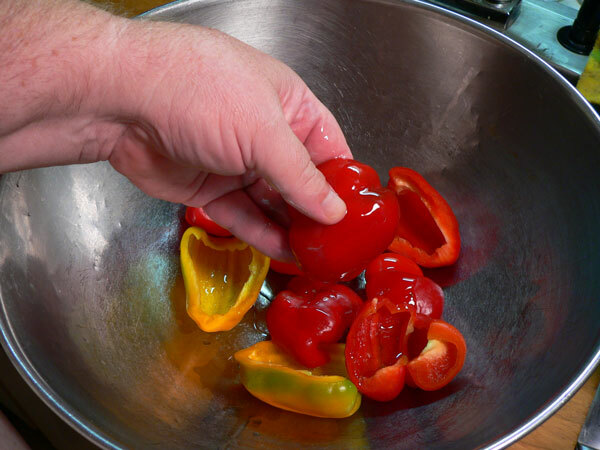 Place the hot roasted peppers back in your large mixing bowl. Cover the bowl with plastic wrap and set aside to let the peppers cool. 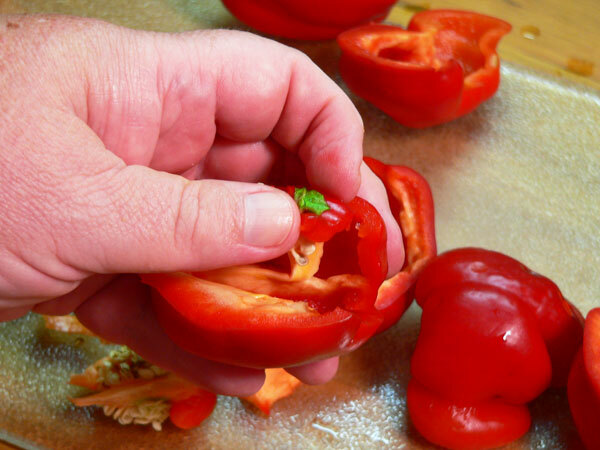 Once the peppers have cooled, you should be able to easily peel away the outer skin from each one. 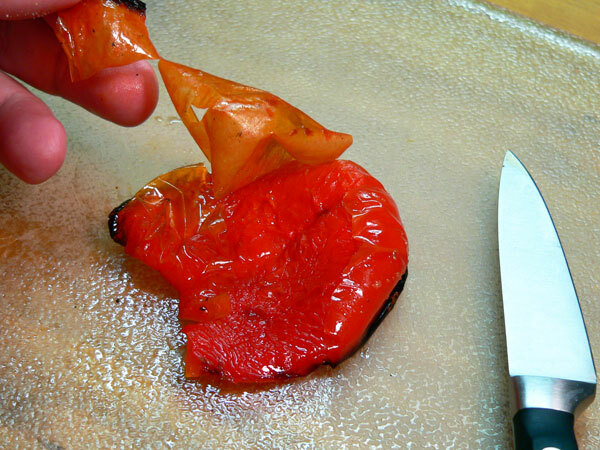 If it doesn’t just slip right off, use your paring knife to help peel it away. You might even need to scrape them lightly with the knife to get them good and clean. Remove the skins from all of the peppers. 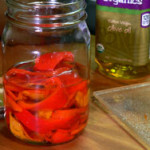 You can save them for use later by placing the sliced peppers in a Mason jar and covering them with more Olive Oil. Just cover them with some Extra Virgin Olive Oil. Put a lid on the jar and set them in your refrigerator. 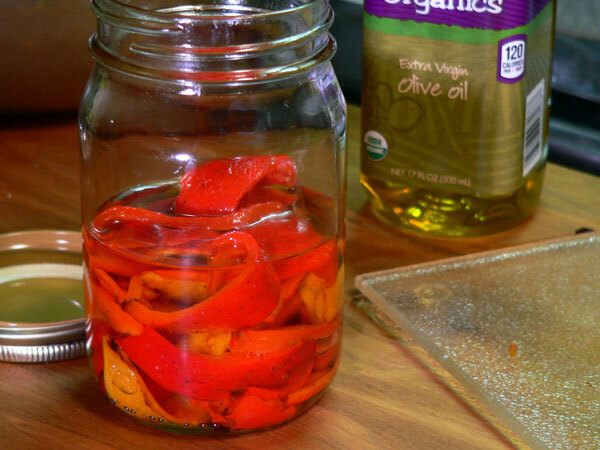 NOTE: The roasted peppers should be used within a week or two of adding the Olive Oil and refrigerating them. The oil will get cold and thicken up but when you’re ready to use them, sit them on the counter until the oil warms back up. 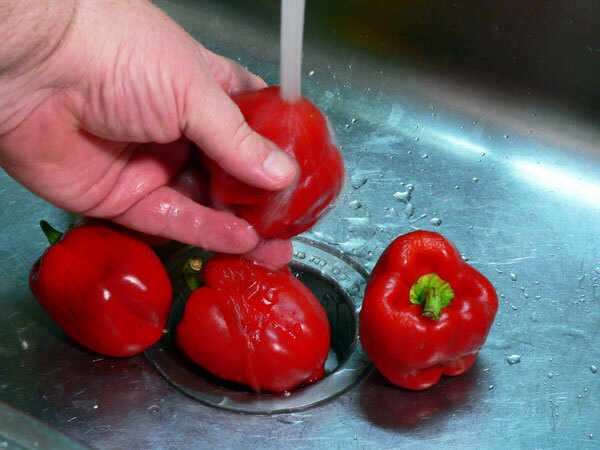 Wash peppers under cold running water. Remove seeds, stems, and trim away excess pith. Place cleaned peppers in bowl. Use your fingers to coat each pepper, inside and out, in the oil. 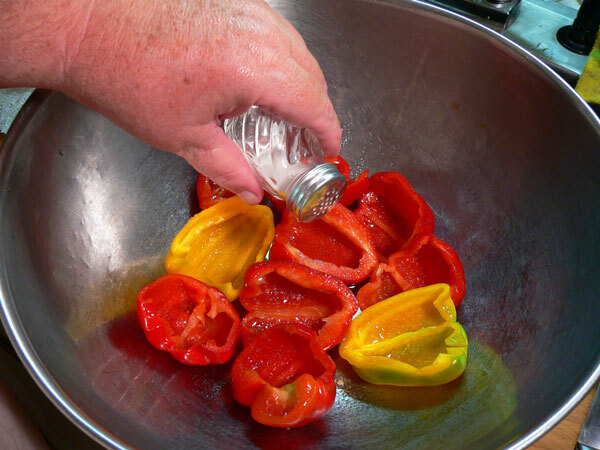 Place peppers on a large baking pan, leaving ample space between each one. Place in 450 degree oven for about 15 minutes or until peppers are tender and charred. 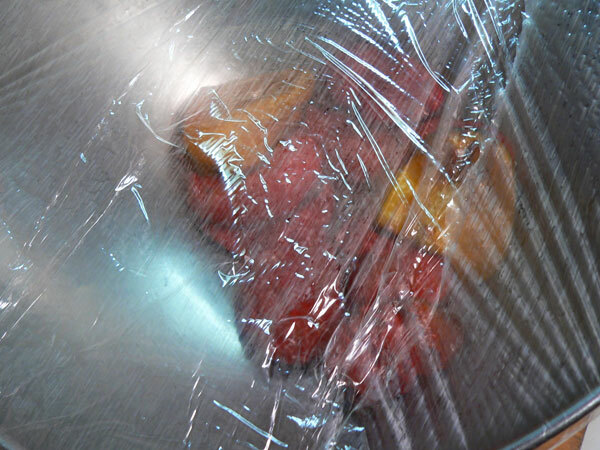 Remove from oven, place back in bowl and cover with plastic wrap until cool. Remove skins, scraping as needed to clean. 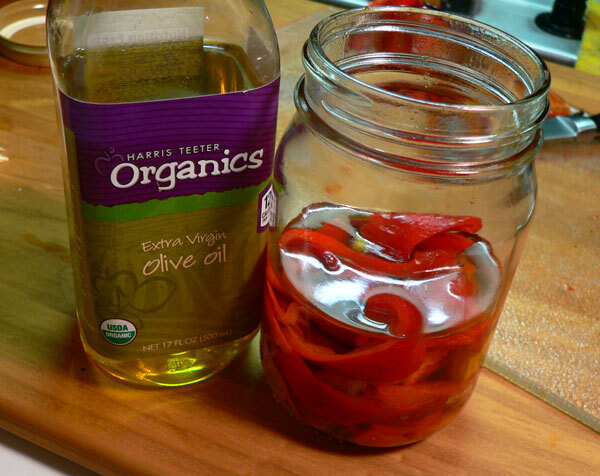 Place in a small jar and cover with olive oil until needed. Your Comments: Do you roast your own peppers? More trouble than it’s worth? 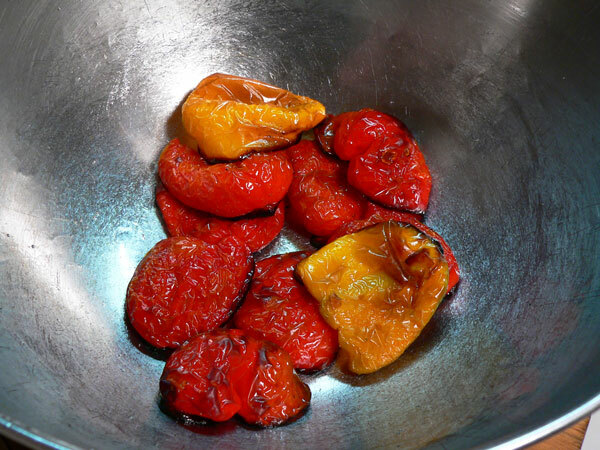 How do you like to use roasted peppers in your cooking? I’d love to hear from you and invite you to take just a couple of minutes to share your thoughts with us in the Comments Section below. Maybe you roast your’s over a gas burner, tell us how you do it. Remember, all of our comments are moderated. That just means that I personally read each and every one of them before they are placed on our family friendly website. I also try to respond to as many of your comments as possible so check back in a day or two for my reply. Thank you in advance for sharing your comments with us and for sharing our website with your family and friends. It’s greatly appreciated. Sign Up For Our Free Newsletter: While you’re here, be sure to sign up for our Free Newsletter. I send out a brief Email Newsletter to remind you of the recipes we’ve recently posted here on Taste of Southern, or to let you know of anything else important that might be happening. It’s a great way to remember to visit with us again and should you ever decided you no longer want to receive them, you can unsubscribe even quicker. You’ll find a sign up box just below and in the top right hand corner of each page of our site. I’ll be looking forward to talking with you again… real soon. When I roast them I do not use oil or salt. I did not see a reason in your article why to use? Mine come out okay.. so.. I froze some this year. They are so delicious in sweet potatoe fritters, chili, veg soup etc.. One of my favorite methods of using peppers now! 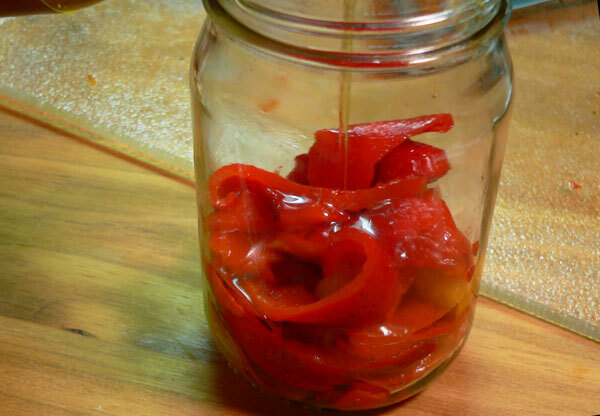 I also dehydrate peppers to use, they are so simple and pretty in their jars on the counter! I made plain and Italian sun dried tomatoes in my dehydrator this past summer with great results as well!